Cave Hill Creek has always been a place to inspire. 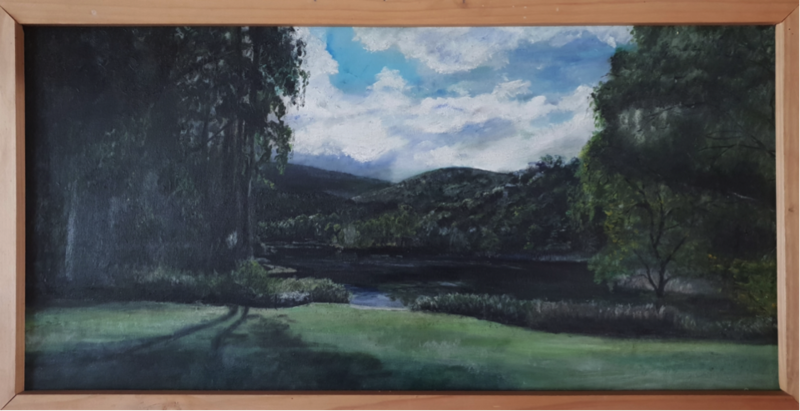 The combination of our beautiful Australian bush setting, lake reflections, expansive mountain vistas, time in the outdoors, and friendly hospitality relaxes the mind and stimulates creativity. Over the years we have been lucky enough to host our share of creative groups and some truly talented guests. Some of them have repaid our hospitality in spades by sharing their artworks with us. So we thought it a great idea to share them with you as this week’s instalment of our ‘30 stories for 30 Years’ series. This first piece is a beautiful work by artist Tammy Jones from Ararat. Tammy visited Cave Hill Creek with friends on a ‘Kreate with Kaszazz’ paper-craft weekend retreat. Painted in July 2017 on recycled timber pailings, Tammy was inspired by brilliant late autumn colours of the Liquidambars and Silver Birches. Ronda Harms and her extended family holidayed at Cave Hill Creek returning over many years in summer, fishing, canoeing, swimming and relaxing. 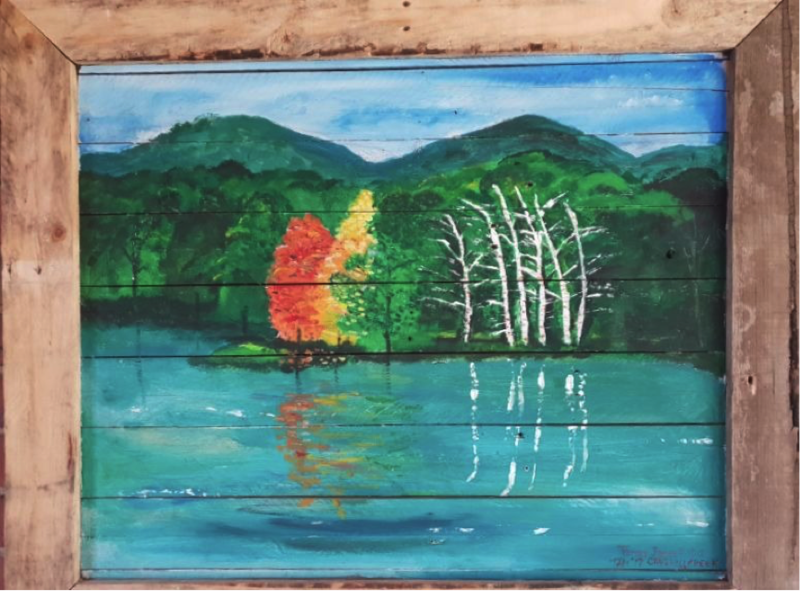 A limited edition print of her pastel, Ronda’s piece captures her family enjoying a summer’s day on the lake. The work has been a feature on our office wall since February 2004. 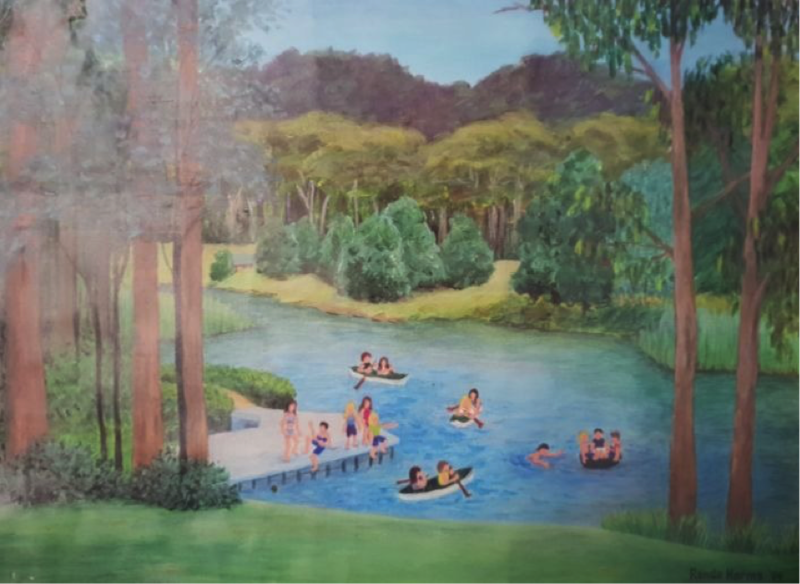 Careful attention to detail has been paid to the jetty and embankment areas by the lake, with the realistic and skilful depiction of the trees in the distance, this piece really captures what it feels like on a carefree afternoon at Cave Hill Creek with family and friends. The final piece is a beautiful work by professional artist Kimberly Riddet. The oil on canvas was commissioned as a gift to Cave Hill Creek by our very good friends at ‘Camp Awakenings’. Camp Awakenings is a leading Australian youth development program for year 9 students with a strong focus on building support networks for the participants through friendship and trust. The painting is based on a photo taken in August 2015. Early wattle blossoms at that time of year appear on the right of the picture. Kimberly’s work is reminiscent of federation-style representations of the Australian bush – conveying a shimmer of tranquillity with the suggestion of a winter storm on the way. For next week’s ‘30 Stories for 30 Years’ instalment, keep an eye out for a truly unique Australian creature. Stay Tuned!